The hostel is in a huge huge house that takes up 1 block! it has everything you need inside! the staff are really friendly and the bar is 24hrs which is cool if you like to drink until late or earlier however you want to put it. The food is delicious in the restaurant and the pool is probably one of the biggest i have seen in South America. Will be back ! 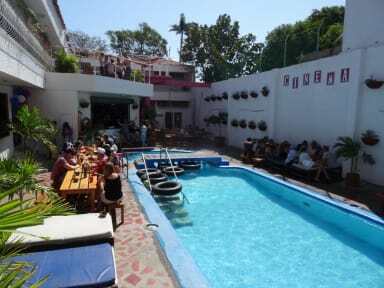 Fun vibrant hostel, big pool that catches the sun for most of the day. Onsite bar and restaurant, the bar was lively at night and is a good spot to meet fellow travelers, play games and share stories. Huge sofa room with netflix and chill. The staff were super friendly and helpful with everything you need. Highly recommend! Huge pool, fun people, massive netflix sofa, friendly staff. Will definitely be coming back here! If you don't stay at Drop Bear you haven't lived! it's an experience! This hostel exceeded my expectations, the perfect place to lounge around in the sun by the pool. There is a relaxing TV room to watch netflix. It is a party hostel and low season here but there were still people around drinking and having fun. The restaurant has great food and fairly priced also! Highly recommend the eggs benedicts. I would stay here again! definitely recommend! Awesome Staff, food in the kitchen was great and fairly priced. The bar is fun and always people around to share a drink with and a game of beer pong. Probably one of the best pools I have seen throughout Colombia. Short 5 minute cab into town but is a nice spot to base yourself to go to Minca or Tayronna for the day as they have free baggage storage. Would definitely stay again and highly recommend. Great hostel, lovely pool and good kitchen! Great if you want to party but also a nice cinema room to chill! Dorms are nice and spacious!Always something going on! Great hostel, quite far from the coast which makes getting to the main square and such a bit tedious, but it's only a short taxi ride. The hostel is ace, Netflix area is particularly amazing. Shame it was quite dead while we were there, really. We got here after our hike to the Lost City and got a private room. Room and bathroom were huge, which was nice because we were totally spent and couldn't socialize. Had a delicious burger and caipirinha for dinner before hiding in our room all night. The music in the social area was super loud, but we couldn't hear it. Traffic sounds from outside were a bit loud, but manageable with ear plugs. Breakfast and coffee were decent, lunch burrito not good, internet was amazing, shower good enough! Paid for a 4 bed deluxe and got given a standard dorm- poor from the offset. Atmosphere wasn’t the best, was meant to be a party hostel however there were 6 people at the bar at all times (even though we did meet some fun people).